Meet Daisy and Skye, two little rescue dogs who are now a part of our family. 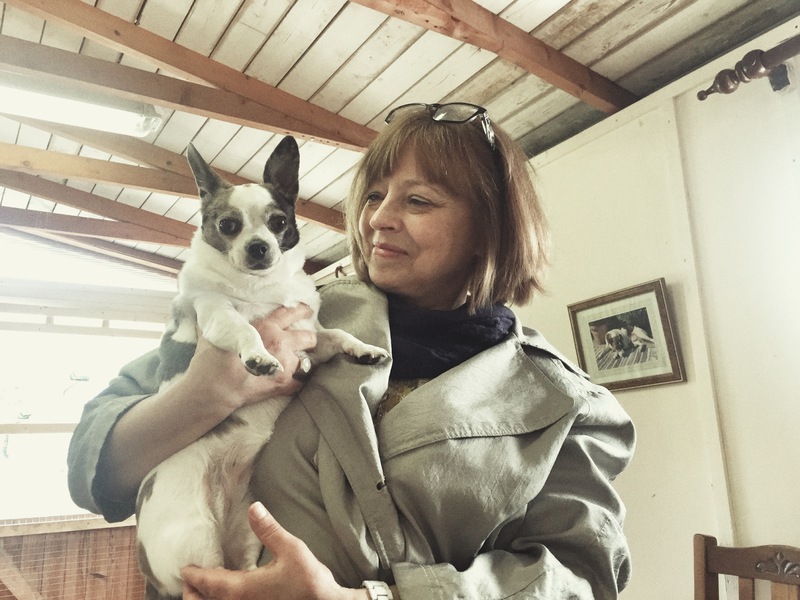 When I visited Carol back in March, she shared her utter joy and relief that she was able to place her beloved dog, Peanut, with a family who loved her and would care for her for the rest of her life. She received lovely text updates as to Peanut’s adjustment and Carol was just over the moon when she saw a video of Peanut doing zoomies around the back yard of her new home. The idea of adopting again has been floated around our house but we’ve been reluctant for different reasons. I even discussed it with Carol and her niece, Val, during my visit. When I returned from NYC I started browsing dog rescue sites and I stumbled upon Daisy and Skye. They were described as loving and sweet companion dogs who are cat-friendly. Also, too, they were in foster care because their owner had passed away. I visited their photo a few days later. We met the dogs and their foster family. The day that we learned that Carol had died, we got the phone call that we had been accepted as Daisy and Skye’s new people. In my grief over Carol, I received a gift and it felt as though Carol was giving me a big nod that day. Today is Carol’s memorial service. What better tribute could I pay my beautiful friend, who adored dogs, than to adopt two little girls who needed a home? The dogs are as sweet as they were described. They had their first sleep at our house and there was no trauma or nervousness. They slipped into our home and our family as if they always belonged. It’s all right and good. Thanks, Di! They are two sweeties. I’m sure Carol would be pleased, and they are so cute. Perhaps there’s a special dog whistle for “you’re blocking Peri’s view of cat tv”? Haha. Also a command not to look at the cat. What a heartwarming story! Sadness and happiness woven together. Here you go again, Kim, making me cry again. I’m back in NJ, getting ready for Carol’s service, and it makes me so happy to find that your two rescus have new people. And what good people! “Peanuts People,” as we now call them, sent some Peanut art to Wiley and a beautiful Edible Arrangement gift basket for our potluck. We are sad, but our hearts are full. Your news just added the cherry on top. I love a good rescue story. It makes my eyes misty too. I’m sure Peri will adapt, cats are good at that. How cute both of them are. They look like they belong with this happy family. Heaven sent. The girls are lovely. Congratulations! Give Peri a few extra head rubs from me, if she’ll let you! 🙂 Heaven sent. I think so. Lovely story, made me shed a tear, rescues are the best!